Well hello and Happy New Year! Yes it's been a while. Everything is more than fine actually. On December 20th we flew back to London to be together again as a family. No more living in different countries to my husband. WAHOO!! A lot has happened since I last blogged - the most annoying being that the boys broke my computer within days of my last post and so I had been without internet until I got back to London (even then, our internet here at home has only just been connected). And where is 'home' for us now? 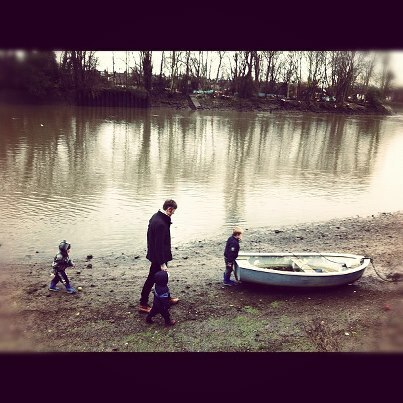 My husband and sister found a wonderful home for us all to live in West London beside the river Thames. Newly refurbished with new carpet throughout, I am in my happy place. And it's WARM! Heaven. So we were together again as a family for Christmas. Very special indeed. I have lots of big ideas and plans for this year which I'll fill you in on in good time. But for now I'm simply enjoying the fact that my husband will be walking in the door in less than 2 hours from now. And then shortly after that my sister will walk in the door too and we will be having dinner together as a family. And then I'll probably leave it to my husband to bath the boys while I do..... something... knitting. Or maybe even some reading. Or looking through Pinterest. But it certainly won't be having to deal with the boys on my own anymore - this makes me very happy! I hope you are well and wishing you a very happy and successful 2013! Lovely to hear from you Miss Brigitte! Just so you know, it is completely normal to play musical beds at night (well it is in my house) we do it all the time!! Love that you are back! Hey Bri-babe ... well in our house ... my husband has been playing musical beds ... erm ... more like kicked off the bed ... because this Isa-babe is ... well....how do we put it ... growing ... round the mid section!?!?! uhuh!!! thats right!!! Your going to be an AUNTY!!!! An aunty to a chocolate rarotongan/maori/samoan munchkin!! I know right hehehe ... I'm SO excited (as is Niko) and we are due March 9th. I love love love ya ... P.s I never go on Facebook nowadays ... you could email isabelle.apulu@jbwere.co.nz if you like ... I'm on that email until Feb 22. Love you to the moon and back my kindred! So happy for you being all together again - what a lovely start to the year for you all!